In terms of size, history and reputation, Colorado doesn't hold a candle to California. I happen to think some of Colorado's wines can compare quality-wise to premium California wines, but they're still just a drop in the bucket compared to their Bear State counterparts. Over the past 50 or so years California wine has been immensely influential in the global wine industry. Despite producing wine for over 150 years, it took until 1976 for California to get the respect it deserved. Colorado on the other hand, not so much. However, many of California's biggest names in wine have their roots in Colorado (including a wine at that Judgement of Paris tasting). Colorado, after all, is known as the headwaters of America for being the source of four major rivers, so why shouldn't it also supply some of California's vintners as well? Perhaps the least-known connection is one of the earliest and most significant. In 1964, Warren Winarski left Illinois and his position teaching at the University of Chicago and moved to the Napa Valley. Winiarski worked for two years at Souverain Winery before becoming the assistant winemaker at Robert Mondavi Winery in 1966. In 1968, Winarski made his way to Colorado "because the pioneering spirit intrigued" him. 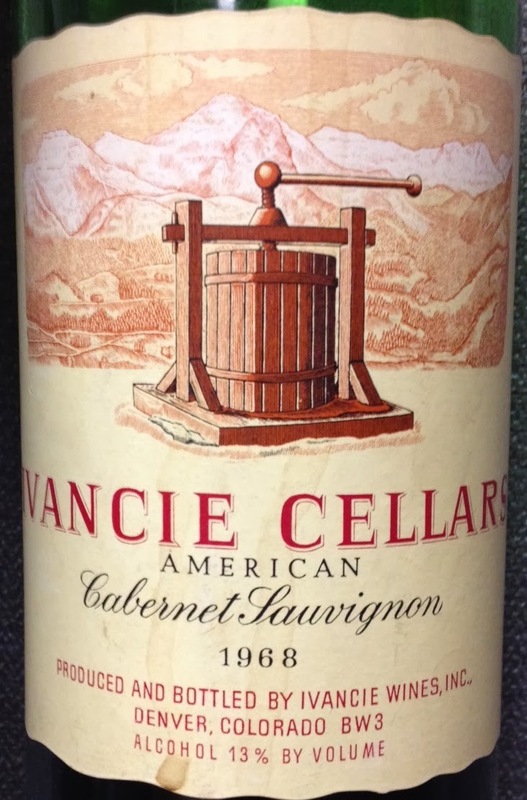 He made wine for the first commercial winery to open in Colorado since prohibition, Ivancie Cellars. Dr. Gerald Ivancie purchased grapes from California and made wine in a basement in Denver, CO. Together, Ivancie and Winiarski were instrumental in bringing Vitis vinifera back to Colorado for commercial wine production. In 1973, Ivancie was successful in convincing six farmers to plant 20 acres of vines in what is now the Grand Valley AVA. However, before Winiarski ever saw a grapevine in the ground in Colorado, he moved back to Napa, purchased 50 acres and founded Stag's Leap Wine Cellars in 1970. In 1973, Winiarski produced just his second vintage of S.L.V. Cabernet Sauvignon. Three years later, this wine would be named best red wine at that blind tasting in Paris, besting the likes of 1970 Château Haut-Brion, 1971 Château Léoville-Las-Cases, 1970 Château Montrose and 1970 Château Mouton Rothschild. Winiarski, and his wine, made history and forever changed the world of wine. In 2007, Winiarski sold the winery and several vineyards to a partnership of Washington's Ste. Michelle Wine Estates and Marchesi Antinori of Tuscany for $185 million. Not bad for a Colorado winemaking pioneer! The early 1970s was flush with transplants from Colorado to California that would go on to become some of California's biggest names in wine. Joseph Phelps graduated from Colorado State University in 1951 and ran the Hensel Phelps Construction Company, one of the largest in the U.S., in Greeley, CO. The wine bug got to Phelps after his company won the bid to build Souverain Winery (yes, the same winery where Winiarski got his start in Napa) in the 1960s. He made wine at his home in Greeley at great expense. Phelps had grapes picked in Napa in the early morning, flown on United Airlines to Denver and crushed in the evening in his basement. In attempt to streamline the process, Phelps attempted to plant grapevines in his yard. Needless to say, the vines did not survive their first harsh Colorado winter. With this defeat as a catalyst, and a desire to change careers, Phelps moved his family to Napa in 1973 and established Joseph Phelps Vineyards. Joseph is now president emeritus and his son, Bill, a 1976 graduate of Colorado College, runs the day-to-day operation of Joseph Phelps Vineyards. Another Colorado College alum actually beat the Phelps' to Napa. In 1970, Jay Heminway purchased 160 acres in the Chiles Valley. In 1972, Heminway began planting zinfandel and in 1977 Green & Red Vineyard was a licensed winery. Heminway now has 31 acres planted mostly to zinfandel, syrah and petite sirah, with a little sauvignon blanc thrown in the mix. Heminway also sells fruit to producers such as Turley Wine Cellars (winemaker Tegan Passalacqua has family that lives in Colorado). Over in Sonoma, another former Colorado Springs resident started a winery focused on chardonnay. Brice Cutrer Jones spent much of his childhood in Colorado Springs and graduated from the Air Force Academy in 1961. In 1973, this decorated combat pilot partnered with Wall Street investors and founded Sonoma-Cutrer Vineyards. After building Sonoma-Cutrer into one of the most popular chardonnay producers in the country, he sold the winery to Brown-Forman and established Emeritus Vineyards, focusing on pinot noir. Back in Napa, high above the valley floor, Donald Long was the proud owner of hundreds of acres on Pritchard Hill. He had bought up land in the 1950s and 1960s, but it wasn't until the late 1970s that Don and his sons, David and Bob, both alumni of the University of Denver, started planting vines in the red volcanic dirt. David opened his first restaurant, Fondue Champones, in Boulder, CO in the 1970s and moved to Petaluma, CA in 1977 and opened another restaurant. Not long after, David and Bob established David Arthur Vineyards. In 2000, Bob established Montagna Napa Valley near David Arthur, also on Pritchard Hill. The Long's neighbor, Harmon Brown, proprietor of Pritchard Hill producer Aril, also has a connection to Colorado as a restaurateur in Telluride. In the late 1970s, after John Kongsgaard graduated from Colorado State University with a degree in English in 1973, he planted chardonnay, after Andre Tchelistcheff's suggestion, on his family's land just to the east of the city of Napa. He apprenticed at Stony Hill Vineyard and with the aforementioned Winiarski at Stag's Leap Wine Cellars before he started working at Newton Vineyard in 1983. He used his family's chardonnay grapes while at Newton until starting his own winery in 1996. The Judge, the triple-digit priced chardonnay bearing Kongsgaard's name and grapes is one of California's most expensive and acclaimed chardonnays. In 1972, Tom, a graduate from the University of Denver Law School, and Sally Jordan purchased land in Alexander Valley. They planted 200 acres of cabernet sauvignon and merlot. In 1974, they purchased 1300 more acres and built a 58,000-square-foot chateau that was completed (at least the production side) just in time for the first harvest in 1976. Today, Jordan Vineyard & Winery produces just a cabernet sauvignon and a chardonnay that can be found on wine lists in almost every steakhouse across the country and has been known to make some great viral videos. Tom's daughter, Judy Jordan, the proprietor of J Vineyards & Winery, worked in Geophysics at Western Geophysical Corporation in Denver before returning to California and working for her family's winery. After learning the ropes at Jordan, Judy started the sparkling brand in 1986, purchased the former Piper-Sonoma winery in 1996, and completed renovations in 1999. Today, J is one of the country's top sparkling wine producers. One of the California's most well-known wineries, and another steakhouse favorite, Silver Oak Cellars, also has strong roots in Colorado. Raymond Duncan has a history in Colorado dating back to 1958, when he moved to Durango to explore the oil and gas industry. He started Duncan Oil Inc. and moved to Denver in the 1960s. Duncan helped found the Purgatory Ski Resort in 1966 and in 2006 was actually inducted into the Colorado Ski and Snowboard Hall of Fame. Ray is also a founder of the Castle Pines Golf Club in Colorado. With an interest in getting into the wine industry, Duncan began exploring vineyard land Napa Valley. In 1970, he began buying land in Alexander Valley, just up the road from where Jordan can now be found, because it was significantly cheaper than Napa. Not long after, he and his partner, Justin Meyer, bought an old dairy farm along the Oakville Crossroad. Named after the property's location roughly halfway between both the Silverado Trail and Oakville, Silver Oak Cellars was established in 1972. For a time, Silver Oak even had a licensed tasting room in downtown Denver, near where the Colorado Rockies' stadium was built. Ray's son, David Duncan, who grew up in Durango and earned an MBA from the University of Denver in 1994, is the current President and CEO of both Duncan Oil and Silver Oak Cellars. At around the same time all the previous people were establishing their wineries in California, Kenneth Monfort was building the beef business started by his father (after he moved to Greeley, CO in 1906) into one of the country's largest. After selling the business to ConAgra, Monfort's sons, Richard and Charlie, became owners of the Colorado Rockies baseball team. Their sister, Kyle, married Tom Futo and together they founded Futo Wines when they bought Oakford Vineyards (adjacent to Harlan Estate) in 2002. In addition to Kyle Futo growing up in Greeley, the Futos are parents to Colorado State University and University of Denver alumnae. The Futos split time between California, Colorado and Kansas (where Tom is from), and their wine is amongst the most expensive and highest acclaimed in all of California. Any discussion of Colorado and alcohol beverage would be incomplete without mentioning the newest member to join the Colorado-to-California wine club. Christi Coors-Ficeli and husband Dave bought GooseCross Cellars in early 2013. Together with her sister Ashley, the Coors' are looking to expand Goosecross' production and strengthen its wine club and national distribution, as well as build a portfolio of wineries. Coors' history in the wine industry is not as storied as any of the aforementioned families, but I bet they know a thing or two about building companies and alcohol sales. I am sure there are many more examples of people in the California wine industry with a connection to Colorado. In fact, I can think of four more just off the top of my head (Duncan A. Meyers, for one). But I wanted to share with you the names of some of the more well-known and prestigious producers. In fact, last November, I invited many of these individuals to tasting of Colorado wines while I was in Napa. When I visited Continuum Estate in 2012, Tim Mondavi and I got to talking about high-elevation vineyards and the cultivars of cabernet franc and petit verdot. Both varieties, I think, do well in Colorado's extreme elevations and Continuum is one of the highest vineyards in Napa and has a large percent of acreage planted to cabernet franc and petit verdot. We discussed the possibility of organizing a tasting; Tim had understandably never tasted a Colorado wine and was curious. Eventually, in November of 2013 I was able to put together such an event, graciously hosted by Tim at his magnificent Continuum Estate. Joining Tim and myself were Bill Phelps, David Long and his daughter Laura, Christi Coors-Ficeli and her sister Ashley, Tom and Kyle Futo, Melinda Kearney of Lorenza Rose (and a former resident of Boulder and CU-Boulder grad), Tim Martin (another former Boulder resident) and Philippe Melka of Atelier Melka, Doug Wilder who publishes the Purely Domestic Wine Report and Burke Owens with Continuum. This illustrious group consisted of two winemakers and a writer with no connection to CO (Tim, Philippe and Doug) and a handful of interested vintners that were curious what their former state's terroir would reveal. With me I brought (or had sent) one white wine (2011 Stone Cottage Cellars Gewurztraminer) and 12 red blends. The tasting was organized as an informal introduction of sorts. The wines were not served blind and were not tasted against any California wines. It was the first time many of those individuals had actually met each other. Tim Mondavi took us on a quick tour of his newly finished winery as we sipped on Stone Cottage Cellars' 2011 Gewürztraminer. The wine was made from grapes grown at almost 7000 ft elevation on vines planted three decades ago. The wine pleasantly surprised everyone, especially Melka who stated, "I can't remember the last time I had a gewürztraminer this good!" Panorama view of Continuum Estate at sunset. We tasted the reds in three flights of four, seated at a large table overly looking a block of cabernet sauvignon, formerly part of Versant Vineyards. I didn't take any notes, as I just tried to chat and answer the many questions that everyone had about the Colorado wine industry over the next 90 minutes. The 2006 and 2007 Guy Drew Vineyards Metate blends were hanging on, but definitely showing their age. The Boulder Creek Winery 2009 Reserve Claret and Consensus II both showed a greater level of concentration, but the oak overpowered the fruit. The Creekside Cellars 2010 Robusto was a bit off. The divergent styles of Canyon Wind Cellars' two brands was apparent between the 2009 Anemoi Boreas, which was full-blown and massively oaked, and the 2007 IV. The IV show a silkiness and floral delicacy the other wines seemed to lack. The Infinite Monkey Theorem's 2009 Syrah and 2010 100th Monkey blend were both rich and divisive. Some people decided that these two were their favorites, whereas others were less than impressed. Last, but not least, Ruby Trust Cellars' 2010 Gunslinger, 2010 Smuggler and 2011 Fortune Seeker were a bit hot, but still crowd favorites. In my opinion, and a few others', the Fortune Seeker was the belle of the ball. Overall, everyone's impressions were positive. Most were surprised that the wines showed a level of density and concentration that they were not expecting. Tim Mondavi said that he expected the wines to be thin and green, but did not find that. He added that the wines reminded him of his wines at Robert Mondavi Winery and Opus One in the early 1980s. He said that wines can get too much attention from a winemaker and undue amounts of new oak is part of that. To him, though he could see potential, they seemed excessively oaked and a bit disjointed. Melka added that he thought with time and practice that those issues could easily be addressed, as the wines showed good fruit flavors and length of finish underneath the oak. The wines with the greatest amounts of petit verdot, Canyon Wind Cellars' 2007 IV and Ruby Trust Cellars 2011 Fortune Seeker, were highlighted by several vintners, including Mondavi, as showing lovely balance and structure. Having some of California's most respected wine producers, all of whom sell wine costing hundreds of dollars and garnering the highest critical acclaim, is a feather in Colorado's cap. When I spoke with Warren Winiarski, he mentioned that he wanted to come back to Colorado to explore how "that seed planted more than 40 years ago has sprouted." Who knows, maybe some of these leaders in the California (and the global) wine industry will explore investing in Colorado, or at least reaching out to Colorado producers to lend some encouraging advice? Very enjoyable, thanks for writing this.